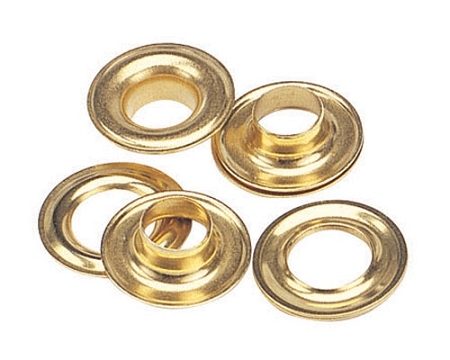 Brass self Piercing Grommets manufactured by C.S. Osborne are for use with our PM5 Bench Grommet Machine tool & dies. No need to pre cut holes for setting grommets. Lay the grommet onto the bench press, lay the canvas on top with a grommet washer and press down the handle. Ideal for quality control and production. Available in 1/4" to 9/16" inside diameter grommets. 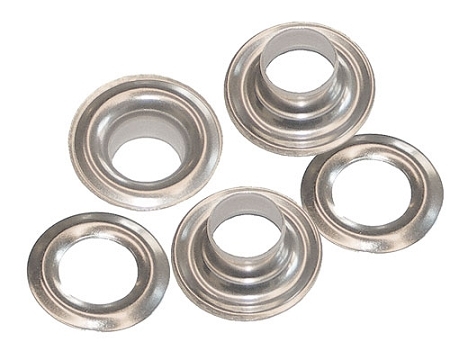 Nickel self Piercing Grommets manufactured by C.S. Osborne are for use with our PM5 Bench Grommet Machine tool & dies. No need to pre cut holes for setting grommets. Lay the grommet onto the bench press, lay the canvas on top with a grommet washer and press down the handle. Ideal for quality control and production. Available in 5/16" to 1/2" inside diameter grommets. Self piercing grommets eliminate the extra step of punching a hole into the fabric to set the grommet. How? The tips of the barrels on each grommet are sharper and the material is more rigid, which allows the grommets to cut their own perfect sized holes every time. Available from 1/4" to 9/16" inside diameters, in Brass & nickel plated brass.